Looking for some fun things to play with this Halloween? ZURU has the answer! Check out the Robo Alive Robotic Spider or collect some of the Smashers Season 2 Gross Range…They’re oozy and a little bit gooey. They’re GROSS Smashers! What’s inside the slimy eyeball? Just throw, smash, surprise to find over 100 disgustingly gross characters hiding inside! Can you find the eyeball with a SLIME surprise? Rebuild & resmash your Smashers eyeball anytime! ZURU continues their next big hit collectable with Smashers – Series 2! The wackiness continues with stomach-churning disgustingly vile creatures – GROSS Smashers! Smash them open and find out what’s sliming inside. Smashers, 8pk RRP $14.99 They’re oozy… and a little bit gooey. They’re GROSS Smashers! What’s inside the slimy eyeball? Just throw, smash, surprise to find over 100 disgustingly gross characters hiding inside! Can you find the eyeball with a SLIME surprise? Rebuild & resmash your Smashers eyeball anytime! Smashers Collector’s Tin RRP $9.99 They’re oozy… and a little bit gooey. What’s inside the TIN? Just throw, smash, surprise to find over 100 disgustingly gross characters hiding inside! Stores over 50 Smashers! Smashers, Sludge Bus RRP $29.99 Take your Smashers on the road with the gruesome Smashers Series 2 Sludge Bus. Collect the two exclusive Sludge Bus characters and unfold to uncover the slimy, vile restroom where you can shoot your Smashers into the toilet! Available now in Kmart, Big W and Target. Please note this competition is open from 18 October 2018 until 5 November 2018 and is only available to members of Mouths Of Mums. This competition is a game of skill – answer in 50 words or less. We are unable to accept entries posted via facebook. Facebook LIKE functionality is not a requirement of entry to this competition. The winners of this competition will be published on this page. Winners’ name and address will be provided to the promoter of this competition and prizes will be sent to the address you have in Your Profile. Please ensure your details are up to date so that you receive your prize. Miss 4 dressed up as a little fairy princess but she had taken a bad fall through the week and had a very large lump and a bruise on her head and a real black eye. Minimal makeup had her looking like she rose from the dead. They are dressing up as skeleton brides and pumpkins. My kids went as a Halloween pumpkin and a space man complete with a jet pack! 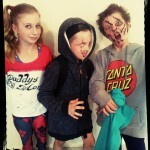 My kids planned on dressing up as spooky super heros! They certainly scared us! A Pokémon. He thinks there are already too many spooky things around so he thinks he should be something more fun and friendly and colorful. My kids had planned on blood covered bodies but they wasted the sauce practicing so they had to be clean bodies. 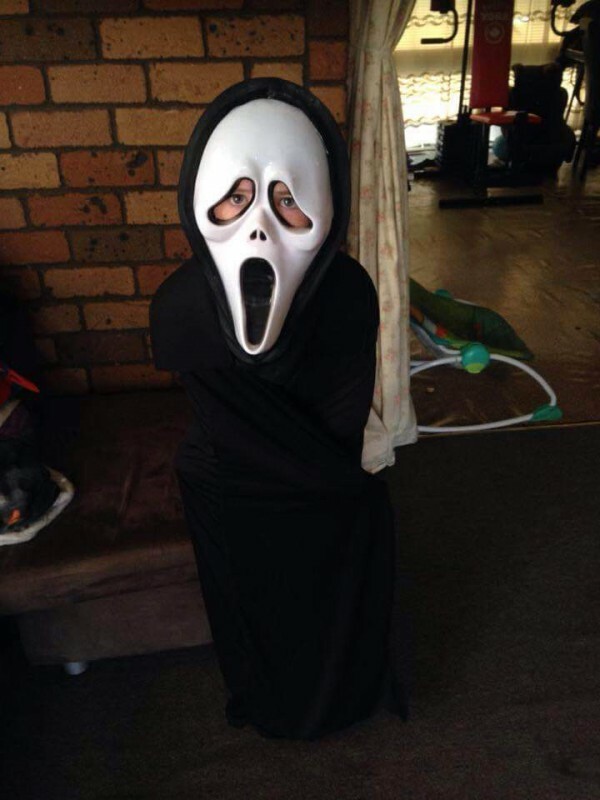 My grandson wants to dress up as an evil cop…when asked why he replied ” I watch the news too nan and there are bad cops too! I was surprised as he is only 5 and already being influenced by media. 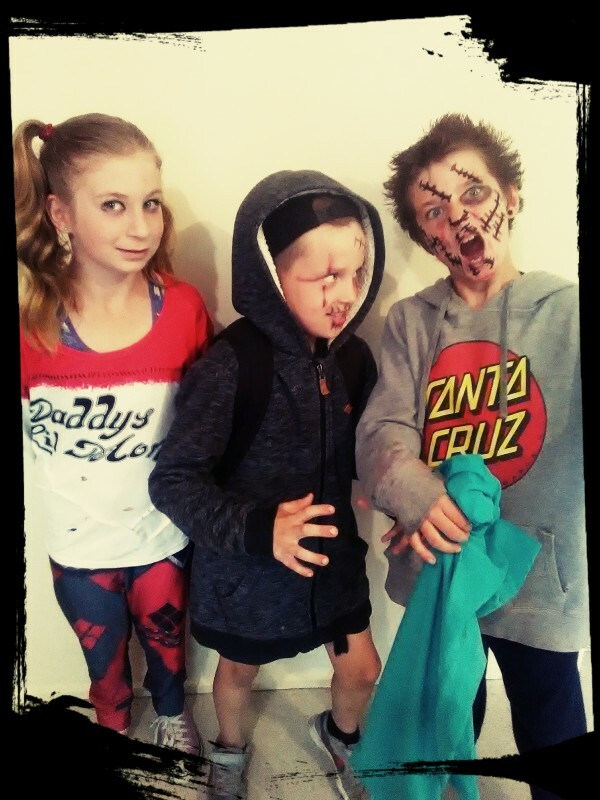 If my kids dressed up as themselves they’d look just like evil elves who love to come and steal your candy! 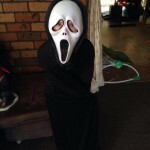 My son was a skeleton, having ASD this was his first year he was truly a skeleton and really enjoyed the trick or treating, so much that it started to rain and he was fine. Ghost Face from Scream. It will be a scream, hehe..